The Consumer Financial Protection Bureau on Thursday dropped a lawsuit against four payday lenders. It's yet another clue the agency may be reversing course under President Trump's interim director Mick Mulvaney. The consumer agency in its lawsuit filed last year accused the lenders of deceiving consumers and unlawfully withdrawing from their bank account to pay debts they didn't legally owe. Since 2012, two of the firms -- Golden Valley and Silver Cloud Financial -- offered online loans between $300 and $1,200 with interest rates of up to 950%. The other two firms -- Mountain Summit Financial and Majestic Lake Financial -- also offered similar terms on loans, according to the bureau. By contrast, the average interest rate charged on credit cards is 16%, according to creditcards.com. But in a reversal, the CFPB said it decided not to pursue the case in federal court. The agency didn't offer a basis for the decision in a statement provided by the agency to CNNMoney. Instead, the agency said it planned "to investigate the transactions that were at issue" and declined to provide further comment since it was an "open enforcement matter." 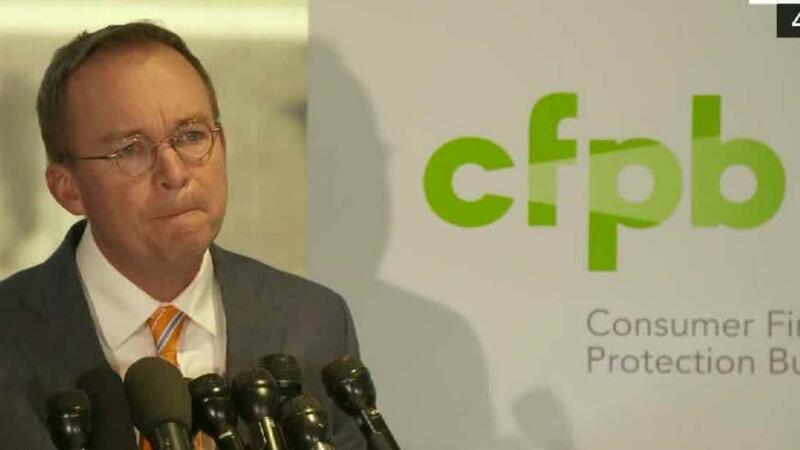 "These actions make the answer to this question crystal clear: Whose side is Mulvaney on, that of lenders charging 300% to 950% interest or American families exploited by predatory lenders?" said Lauren Saunders, associate director of the National Consumer Law Center. Consumer advocates argue such payday loans can wind up trapping borrowers in a cycle of debt that is often difficult to escape. Payday lenders argue high fees and interest rates are necessary because lending to those consumers is risky because they're less likely to repay the loans. Earlier this week, the agency announced plans to reconsider rules regulating payday loans that were approved in October. The rule, which technically went into effect on Tuesday, would require payday lenders to vet whether a borrower can pay back their loans. It also would have restricted some loan practices.